Xi Jinping, President of the People’s Republic of China, announced the One Belt One Road (OBOR) initiative in late 2013 during a conference in Kazakhstan. 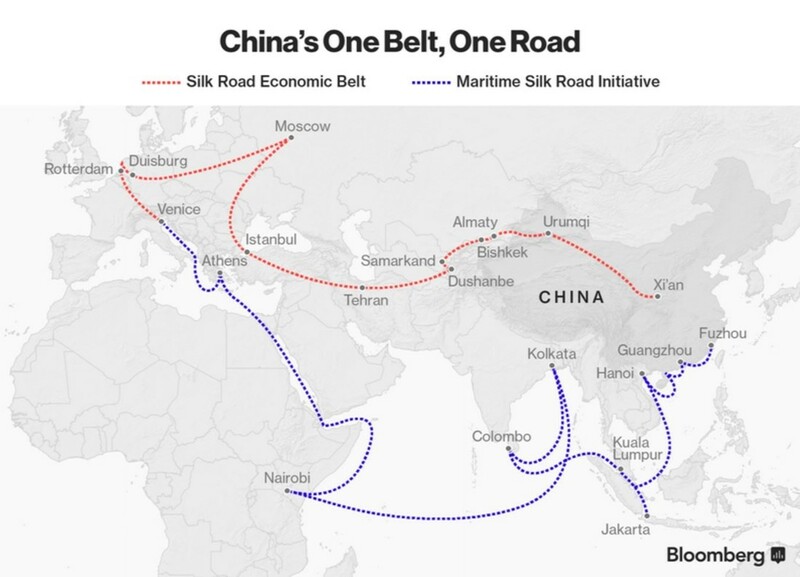 The initiative aims at revitalizing the iconic Silk Road through six economic corridors that will facilitate international trade in over 60 countries ranging from Asia, Europe, Oceania and Eastern Africa. The term belt refers to an economic overland linkage to connect these areas, while the road refers to a maritime network of routes. The ultimate goal is to promote a free flow of economic factors and improve market integration. The areas covered by OBOR account for over half of the world’s population and around 40% of the global GDP. Some economists have compared it to the Marshall Plan promoted by the US after World War II to help revitalize European economies. OBOR, however, is estimated to be about twelve times larger in scale. Building highways, railways and fiber optic networks through Eurasia will require a gargantuan amount of funds. The Silk Road Fund, which was set up in 2014 as a limited liability company, will invest mainly in infrastructure and resources. The Asian Infrastructure Investment Bank (AIIB), a multilateral development bank set up by 57 countries (prospective founding members), addresses infrastructure needs in Asia. Another chunk of capital will come from Chinese policy banks such as the Export-Import Bank of China and the China Development Bank. Beijing is planning to spend a cumulative total of $4 trillion on infrastructure investments in an unspecified period. However, to achieve its goals, OBOR has to rely on private investments as well. In this regard, Hong Kong has been chosen as a belt and road launch pad, to attract foreign businesses and investments and channel them into funding OBOR projects. The long-term nature of these projects, the possible construction delays and the instable political situation of many of the covered areas make this a risky investment. On top of that, there is a need of transparency and accountability, standards with which investors like AIIB have to comply. Chinese propaganda argues OBOR will develop markets and increase prosperity across the regions through public infrastructure and new jobs. Jinping has said in a speech held in 2016 that around 100 countries and international organization are already participating actively in the project. Market conditions, such as foreign exchange volatility, price instability and risk of recession, as well as political factors can have a dramatic influence on the outcome of the OBOR. The initiative will probably take decades to complete and has to face numerous obstacles, but if successful could reshape global trade.